1 Consultant Neurologist, Neuro Clinic & Falij Care, Karachi, Pakistan. 2 Ismail A. Khatri, MD Associate Professor of Neurology King Saud bin Abdulaziz University for Health Sciences, Riyadh, Kingdom of Saudi Arabia. 3 Aga Khan University, Karachi. 1 Department of Medicine, BBS Teaching Hospital, Abbottabad. 2 Department of Medicine, Women Medical College, BBS Teaching Hospital, Abbottabad. 3 Department of Surgery, Ayub Teaching Hospital, Abbottabad. 1 Department of Biological and Biomedical Sciences,The Aga Khan University. 2 Institute of Nursing Sciences, Khyber Medical University, Peshawar, Pakistan. 1 Dr. Muhammad Adnan Aslam Assistant Professor Neurology at Sir Ganga Ram Hospital Lahore. 2 Ahsan Numan Associate Professor and Head Neurology Services Hospital Lahore. 1 Resident Neurology (FCPS), Dept of Neurology, Shaheed Mohtarma Benazir Bhutto Medical University Larkana. 2 Assistant Professor, Dept of Neurology, Shaheed Mohtarma Benazir Bhutto Medical University Larkana. 3 Professor and Chairman, Dept of Neurology, Shaheed Mohtarma Benazir Bhutto Medical University Larkana. 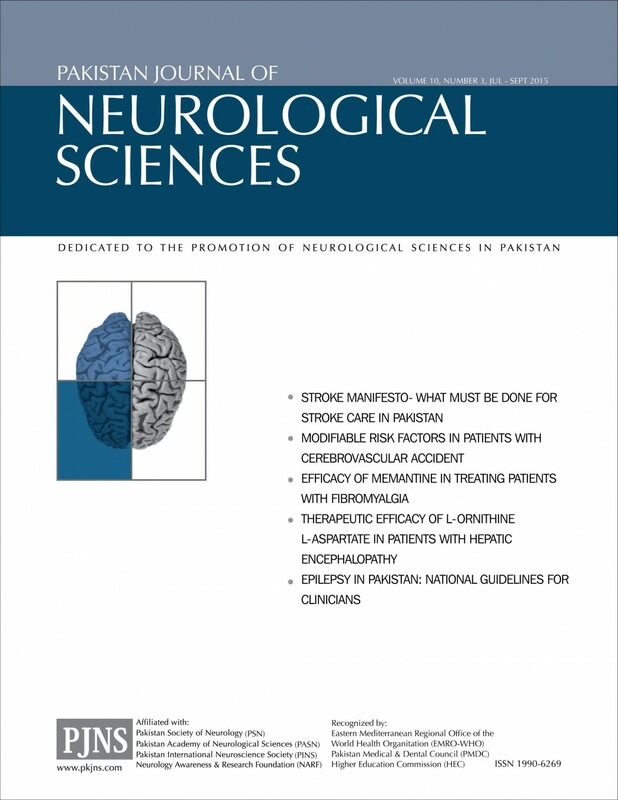 1 Department of Neurology, Pakistan Institute of Medical Sciences, 44000, Islamabad, Pakistan. Department of Neurosurgery Lady Reading Hospital Peshawar. 1 Neuro Clinic and Care, Karachi, Pakistan. 1 Assistant Professor Medicine Jinnah Medical College Hospital. 2 Associate Professor Medicine Jinnah Medical College Hospital. 3 Professor of Medicine, Jinnah Medical College Hospital. 1 Neurology Physician, Department of Neurology, Ministry of Health Bakirkoy Dr. SadiKonuk Training and Research Hospital, Istanbul. 2 Algology Physician, Department of Algology, istanbul University Medicine Faculty, Istanbul. 1 Department of Neurology, Aga Khan University, Karachi. 2 Children Medical Center, Lahore. 3 Department of Radiology, Aga Khan University, Karachi. 5 Neurocare and Falij center, Karachi. 6 Bolan Medical University, Quetta. 7 Department of Neurosurgery, Aga Khan University, Karachi.